This is not a tutorial on learning how to animate — for that, I recommend Richard Williams’s excellent book The Animator’s Survival Kit. This tutorial is about what to do with those animations. How do you get them inside the game? What code do you need to make a character play one animation when walking left, another when walking right, and yet another when standing still? There are essentially two ways to handle this. Since the decision for which to use will usually lie in the hands of the game’s artist, I don’t want to say “this way is better than that way, so I’ll only show you how do do it this way”. The “correct” way is really whichever lets the animator do his job fastest, so I’ll explain both methods in separate blog posts. The first method, which I call the “divided timeline” approach, uses the timeline very heavily, with labels and even code(!) on frames. Let’s see how it’s done. I call the second method the “state MovieClips” approach, and I explain that in a later post. Click here to read it. Rather than create a whole new game to use as a demonstration, I’m going to add animations to the game I made in my avoider game tutorial. If you followed that tutorial, you should be able to apply this directly to the game you created. If not, don’t worry — you can, of course, use this in your own games, but you might like to download the zip file of the game I made, to make it easier to follow. 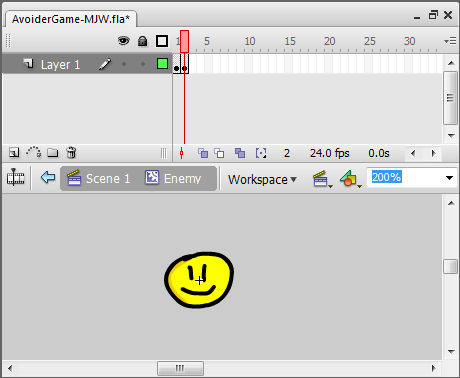 In case you’ve never used Flash to animate a symbol before, I’ll quickly run through the steps to give the Enemy movie clip a looping animation. If you’re familiar with all this, you can just skim this section. Flash animation works a bit like a flickbook; basically, it just plays a bunch of images in sequence. Sure, you can do much more complicated things than that, but at its core that’s all it is. Repeat this as many times as you like to get the animation you desire. Remember to make the image on the last frame look almost identical to the image on the first frame, or it’ll be “jumpy” when it loops. It might help to know that you can copy a frame through the right-click menu, and paste it anywhere on the timeline in the same way. As you can see, Flash automatically loops the animation. The game feels a lot jerkier, because as well as slowing down the animations, lowering the fps also causes the screen to be redrawn (re-rendered, or refreshed) less frequently. However, because all our game logic is controlled by a timer, rather than by the frame rate, the speed at which the enemies and the avatar move does not change. So, those are the basics. Check out the great tutorials on Tutorio.us for more. You could do the same for the avatar, but I think we can do better. How about having five different animations: one for movement in each direction, and one for when it’s standing still? Next, let’s add an animation to be played while the player is moving right. Create a blank keyframe just after the “standing still” animation by right-clicking the first empty frame on the timeline and selecting Insert Blank Keyframe. The “moving right” animation needs to be added to the end of the “standing still” animation, but separated by this new blank keyframe. So, if your “standing still” animation takes four frames, and you want your “moving right” animation to take another four, then the blank keyframe should be on frame 5, and “moving right” should take frames 6, 7, 8 and 9. If you run your game now, then, of course, it’ll look a mess, with the avatar switching between standing still and looking like it’s moving to the right, no matter whether or not it actually is moving. We need to tidy this up. Close this panel. You’ll notice that the frame you just edited on the timeline will have a little “a” on it. This stands for “actions”, as in ActionScript. Run the game, and you’ll see the animation just plays the first four frames. 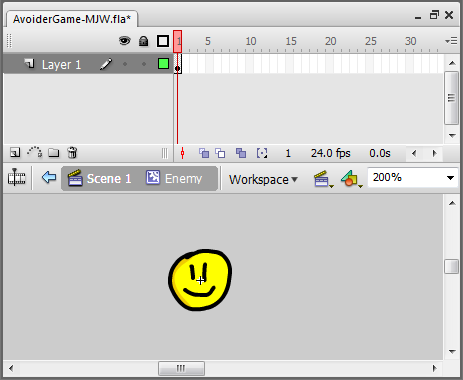 As soon as the animation reaches the blank keyframe, the line gotoAndPlay(1) is run, and this send the animation back to the first frame. 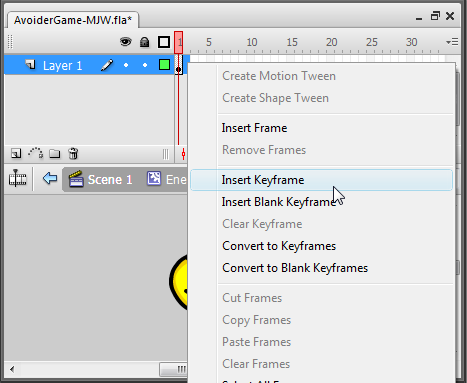 Create a new blank keyframe after the “moving right” animation, right-click it, and select “Actions”. We’re going to make this one loop as well. Make sure you use speech marks, and that the text matches your label exactly, right down to the capital letters. As you can see, the avatar plays the correct animation when the right arrow is pressed… but it doesn’t stop playing it when it’s released. Can you see why? It works, more or less. Except… the animations aren’t actually playing, are they? Only the first frame of each is being shown. Have a think about why this is; in the meantime, let’s get the other three animations in there. Add new animation frames to Avatar’s timeline. Give the first frame an appropriate label. Add a new blank keyframe. Bring up the Actions panel for that keyframe. Add avatar.gotoAndPlay("Label"); to the correct place in AvoiderGame.as. Now we need to sort out that bug where it only plays the first frame of the animation. Did you figure out why it was happening? It’s because we call gotoAndPlay("MovingRight") (or whichever direction) every tick. 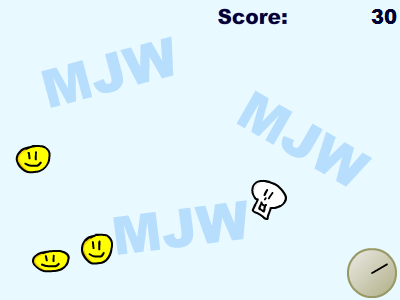 If the player holds down the right arrow key for ten frames in a row, then each frame we’re telling Flash to play the animation starting from the frame labelled MovingRight. I’ve used the word state here to denote the type of animation that’s currently playing. Yikes, that’s messy. Does it work? So that’s the “divided timeline” approach. Click here to read the next part of this mini-series, where we’ll look at the other approach: using one movie clip per animation state. Before then, why not see if you can figure out a way to tidy up that messy code in AvoiderGame.as? The zip file with all the files I modified is available here. Are you by any chance related to Richard Williams? Haha Mushyrulez, I nearly wrote “(no relation)” after his name Nah, not as far as I know at least. Good job on the tutorial! I’m often try to use tweening as much as possible though and reduce frame by frame animation . For smooth purpose. Your missing something… Enemy animation change based on which direction he moves!, A little tricky… well until you play around with “current label”. This is a small chunk of my game, to get you started, especially if anyone needs the enemies to switch animations. Although as always, there is a better way to do it. yuck, sorry the code is hard to read, intresting that the last of it was put in a scrolling box.. hm… how would I “box” the code next time? Nice one Kevin. Hey, you could use the rotation to affect the animation too, so an enemy walking upwards would only show the back of his head. Oh, WordPress comments seem to do that with code, it’s really irritating. To create your own code box you just use “pre” tags: <pre> before the code and </pre> after it. I plan to have 3 animations, but I haven’t done them because I wanted to get it working first. I tried to call a function when the enemy was created, but I kept getting “TypeError: Error #1009: Cannot access a property or method of a null object reference. Where exactly are you calling it from at the minute? I know you said “when the enemy was created” but if you could provide a snippet of the surrounding code that’d be great. Once again I’ve made a silly little mistake. Thanks for the easy fix. One of these days I’ll make a non-typo mistake. thanks again. Good catch. No problem The silly mistakes are often the hardest to spot, and the most annoying to find. What if my Avatar is a character with a walkcycle of several layers and frames packaged into a MovieClip. How can I get him to play only on keyPresses? I have done it by writing code directly into the fla. file when I gave it an instance name, but I can’t figure out how to do it in classes. If you want to avoid writing code directly into the FLA file (i.e. on the timeline) you can use State MovieClips. That’d give you an easy way to bundle up all your layers into a single simple object as well. Thank you very much for your tutorials, they helped me quite a lot. Still trying to just get the basic aniimation going, so I haven’t bothered with different types yet. PurpleFish is just a movieclip that’s exported for as but no code added. It has (among others)a frame labelled “swimRight”. 1061: Call to a possibly undefined method gotoAndPlay through a reference with static type flash.display:DisplayObject. Do you have any idea how to solve this? Thanks in advance! One of the primary requirements is, of course, the gloves.